Our linen service offers a variety of dust control products. Making a great first impression on your guests with a clean facility will be easy with our dust control products. In addition to helping you keep your facility sparkling, you can reduce allergens with our products designed for dust mite control, making your guests even more comfortable. Our plants use commercial, sophisticated equipment to ensure that you get ready-to-use products every time. We inventory a full range of sizes, colors, and styles of dust control products. Your representative will help you select the right products for your dust control program. Let your customers know that you have thought of everything, from floor to ceiling when it comes to providing a clean, enjoyable atmosphere. Our linen service custom mats will protect your entrance floors, and make a great first impression with your company logo, slogan or image on the mat. • Mat Sizes: 2×3, 3×5, 4×6, 3×10 (Custom sizes available upon request) Our protective mats not only protect your flooring, but also keep customer and employees safe from slips caused by slick, wet floors. Cleaner, safer and better-looking floors are easily maintained with our mops. Our dust, wet and microfiber mops come in a variety of sizes (18″, 24″, 36″, 48″ and larger), and are easy to use due to the heavy-duty hardware that swivels a full 360 degrees, so you can reach the dirt wherever it hides. Our wet mops are made of anti-bacterial fibers that prevent odor and mildew, and our synthetic dust mops are specifically designed for dust control and pick dirt up instead of just moving it around. Plus, our mop heads are color-coded by size, so each department or function can have its own equipment, making janitorial operations headache-free. And the best part, we provide all the handles at no charge, leaving you with nothing to buy and no hidden costs. 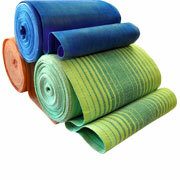 Your linen service offers a variety of Shop Towels, Rags & Wipes. Every business needs them. We give our customers a choice of 100% cotton and mixed rags. Our rags come in 5 lb. and 25 lb. box packaging. • Yellow – Used exclusively by body shops that need the assurance that their towels are not used in other areas. • Orange – Used ONLY in areas where exposure to metal shavings is possible. • Blue – For normal grease, dirt, and oil uses. • White – Used ONLY at printers to assure that wipers are not used in any other areas. Our Route Sales People will help you choose the right towel for the job.